Brookside is a 3900 sf affordable luxury home located 1/2 mile from Breckenridge Main Street and 1/4 mile from the town shuttle. It is a fantastic home with a gourmet kitchen. It has a King master suite, 3 queen bedrooms, one of which has a loft containing an additional 2 twin beds, and a bunk room with a queen bottom and twin top. Set up for skiing, it has a large ski room with benches and individual lockers. Just 1.5 blocks from shuttle stop or short 1/2 mile to base of Peak 9! For complete privacy, it sits on over an acre of land, so it feels totally secluded even though it's in town. The name 'Brookside' describes the unique setting of this home ~ built like a bridge over the Illinois Creek. 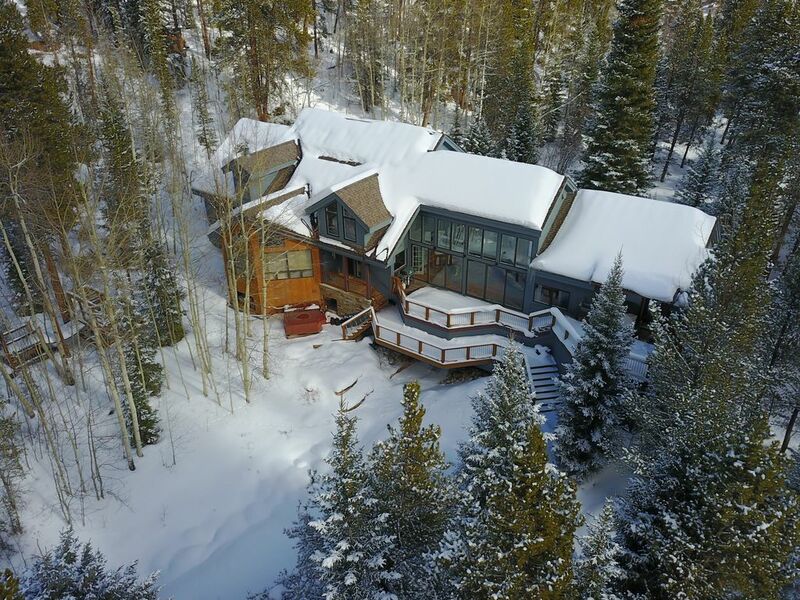 Sitting in an aspen grove with a spectacular view of Peak 8, and the soothing sound of your own babbling brook, Brookside is the perfect getaway for ALL seasons. Come to Brookside, tranquility awaits! We are a family of 4, who love the mountains! It is such a short walk to town and all that Breckenridge has to offer. The setting is truly 'one of a kind'! It is so close to town, yet feels so secluded. Sitting on the deck with the creek running beneath you, and Peak 8 rising before you, is an experience that will stay with you for the rest of your life. Amazing, beautiful home. Private and secluded yet easily accessible,. Perfect location for skiing and Main Street. Our group of 11 adults had plenty of space and comfortable beds. Really enjoyed the spacious hot tub. Owner was so kind to have it promptly filled/top-it-off twice during our 5 night stay. We had 10 adults for a holiday family gathering. We had plenty of space for everyone. Well equipped kitchen - we cooked several nights. The home is in a very private setting not too far from town. We used ski-Uber to get to and from the slopes as the shuttle was too far to walk. Hot tub was great! Outdoor BBQ grill was great! WiFi and television were great. Nice large ski room to keep all ski equipment. Our entire crew really enjoyed the home! This is a great Breckinridge rental. Our family had a wonderful time. We were pleasantly surprised there was a decorated Christmas tree and mantle in the family room that we enjoyed on our Christmas week vacation. It was a beautifully decorated house. It had several rooms that our large family could gather in. The scenery of the mountain from the sunroom is stunning, especially with all the snow draping the landscape. I loved that the kitchen was centrally located and well stocked with everything we needed to cook with for our large group. We really enjoyed the hot tub and it’s easy access to and from the house. The master bedroom was a wonderful retreat in itself as it was away from the other rooms. The steam shower upstairs was a big hit. A lot of snow fell the week we were there which made it great for skiing and for my young grandchildren to sled down the driveway. The storage/ ski room location made it very convenient to store all the ski equipment before entering the house. This home is within walking distance to the shuttle but when carrying skis and children , we did not attempt it. It was easier for us to shuttle ourselves. We truly enjoyed the whole week. Wonderful memories were made that we will cherish forever. The only issue we had is that we didn’t know how to control the heat/ heated floors and it got quite warm upstairs in the bedrooms. Thankfully windows could be opened in those rooms. The owner was always quick to reply to all my questions during the booking process. I’m sure he would of addressed our heating questions if contacted. Several contact numbers were listed in the information packet in the house but we chose not to contact him regarding the warm rooms and just opened the windows. Thanks again for sharing your beautiful home for us to use to celebrate Christmas and a a 60th birthday. I would love to see the property in the summer. I’m sure it’s even more stunning. Thank you for the wonderful review! We're thrilled that you had such a memorable time in our home. Sorry you didn't call about the heat. Heated floors are wonderful for many reasons, but they are very slow to react to changes with the thermostat. You did the right thing by cracking the windows. Also, when it is warm and sunny, the sunroom gets quite warm and that heat will rise to the upstairs rooms. We have found that, on those beautiful Colorado days, keeping the bedroom doors closed during the afternoon helps to keep them from getting too hot. We had a wonderful time with family. Celebrated my 70th and the home was very comfortable for everyone. This is a beautiful home. The pictures don't do it justice. We fit 11 adults very comfortably. Would definitely stay here again. Beautiful Home in a great location! This place was beautiful! The kids especially loved the loft area, they loved having a sleep over! The beds were comfortable and everything you could need for a comfortable stay was provided. It was also so close to the shuttle and town, which was nice! We would definitely stay here again! Reservations cancelled at least 60 days prior to arrival date will receive a 100% refund. Reservations past that time will get a 50% refund. Breckenridge Business License No. 47146.